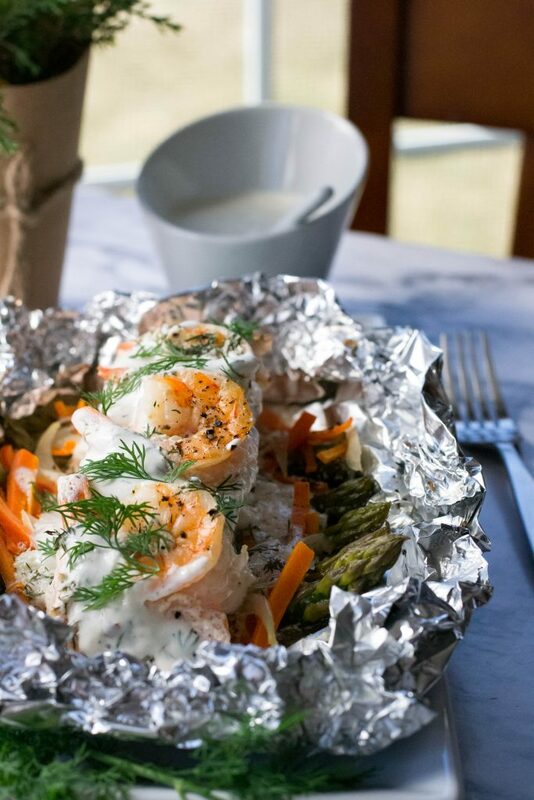 Creamy Dill Salmon Shrimp Foil Packs - What the Forks for Dinner? For the longest time, we did not have anywhere locally to buy good seafood. Our local County Market has recently (or at least I just discovered) added an excellent seafood section. They had a unique store set-up when I made the Bacon Lobster Grilled Cheese in which they had all the seafood displayed right when you walked in the door. Lobster tails were the deal of the day. Spring is in the air, and a light salmon dinner with asparagus (which is just starting to pop up in stores) sounded like just the ticket. Topped with a creamy dill sauce and a few pieces of shrimp for just a little extra something. Asparagus, carrots, and shallot made a light slightly sweet base for the salmon to set on. 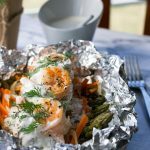 Alternate the direction of the asparagus on the foil sheet, so the tips were facing out gives an elegant presentation. Julienned carrots added a pretty color. Garlic or onion seemed too harsh, so I chose shallots to finish the dish. Their mild, mellow flavor was perfect. Dill screams Spring to me, and a sour cream based sauce full of dill and garlic was just the topping this packet needed. Super easy to whip together with only a few ingredients. Red pepper flakes added a touch of heat, please omit them if you do not want the heat. 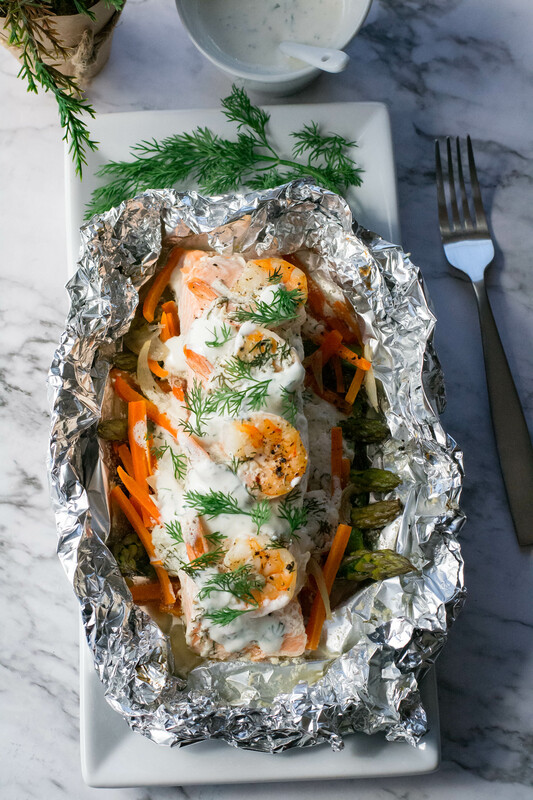 Foil dinners are one of the new trends showing up all over the food world. A veggie base, topped with a protein like chicken or fish makes a delicious all in one, no mess meal. Make them fancy like our Creamy Dill Salmon Shrimp Foil Packs or a throwback to the traditional Hobo pack and use burger and potatoes. Foil packs make cleanup a breeze. Everything all in one neat package. Just toss in the garbage after the meal is done! Leaving more time for the things you want to do! 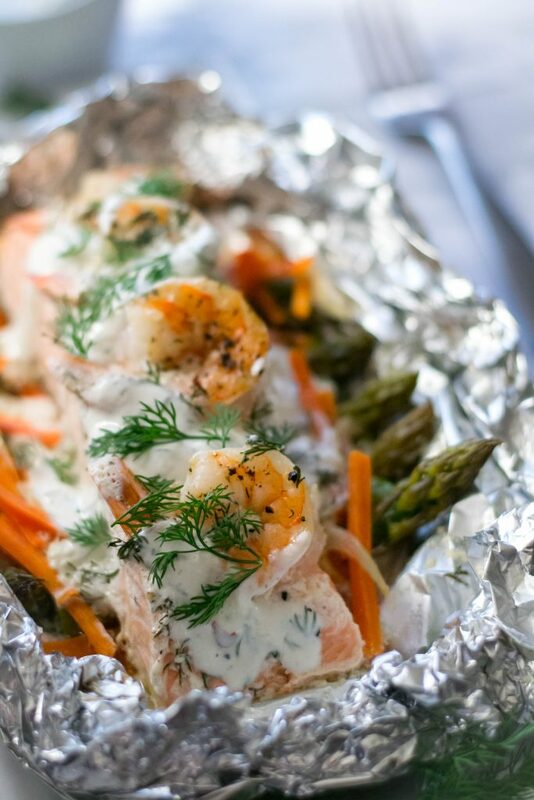 Cut 2 sheets of aluminum foil of 15-inches in length. Spray each sheet with non-stick cooking spray. Combine sour cream, white wine, black pepper, red pepper flakes, garlic, and 1 tablespoon dill in a small bowl and set aside. Brush salmon fillets with avocado oil. Place salmon fillet over each layer of veggies on foil. Arrange 4 pieces of shrimp on top of each salmon fillet. 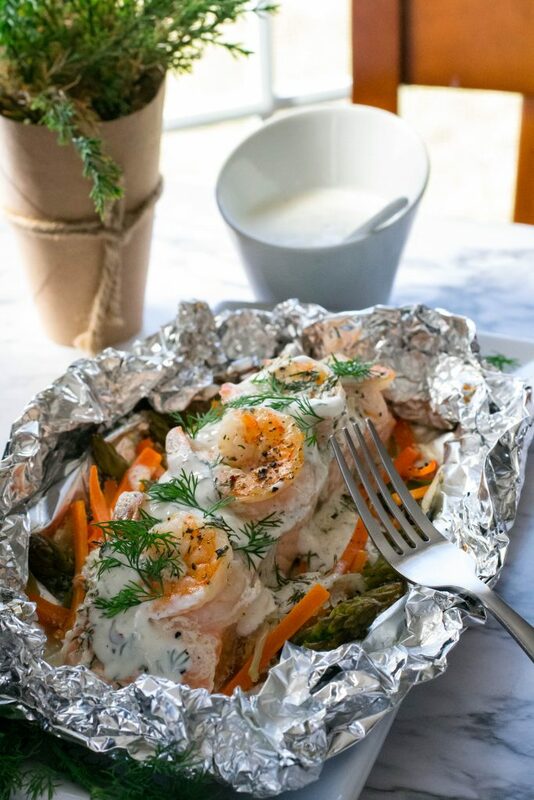 Drizzle about 1 tablespoon of the dill cream sauce on top of each packet and sprinkle with fresh dill. Wrap sides of foil then fold up each ends to seal. Transfer to a rimmed baking sheet and bake until salmon has cooked through, about 20 minutes (adjust the time based on the thickness of your salmon fillets). 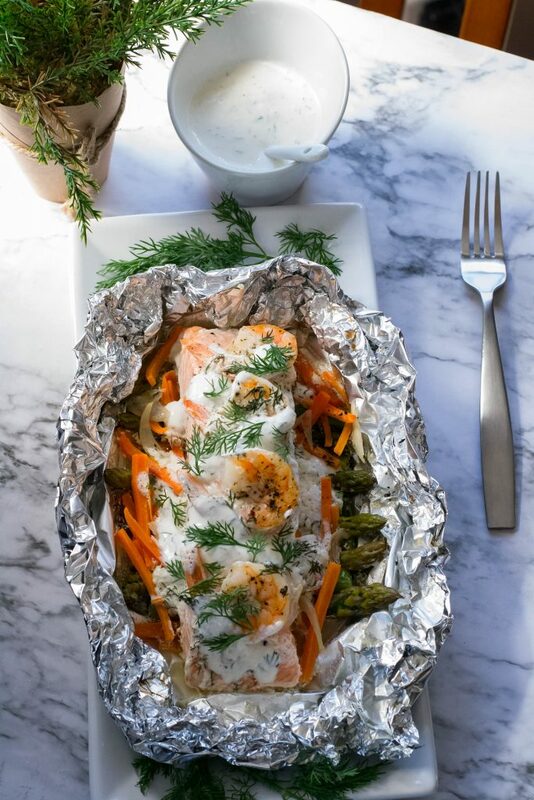 Carefully open foil packets and serve warm with additional dill cream sauce.